He has been busy with the shoot of Ae Dil Hai Muskhil in which Ranbir Kapoor, Anushka Sharma, and Aishwarya Rai Bachchan are the lead actors. Top actor Siddarth Malhotra is one of the promising actors in Bollywood among the young artists, and he scored stupendous hits. His innovative script selection has been widely discussed all over. Bubbly actress Alia Bhatt has been interested in doing energetic roles, and she proved her acting skills with the films Highway and 2 States. She surprised the audience with her performance after which she has been lined up with films from top production houses. Her recent outing Shandaar with Shahid Kapoor ended up as a disappointment, and she is getting ready for various movies. Pakistani actor Fawad Khan established an enormous female fan base with his debut film Khoobsurat starring Sonam Kapoor in the lead role. He has been approached for various movies and Fawad is in plans to stay for a long time in Bollywood. 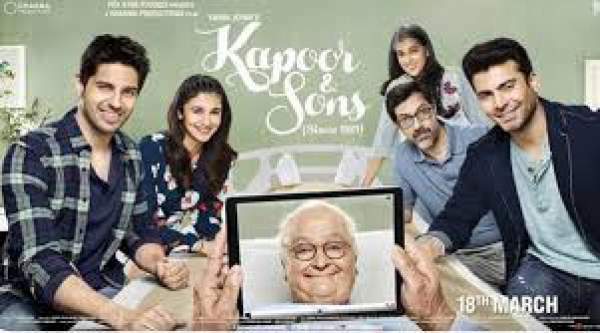 Siddarth Malhotra, Alia Bhatt, and Fawad Khan teamed up for a family entertainer titled Kapoor & Sons, which is one of the most awaited films this year. The theatrical trailer of the movie raised the curiosity of the audience all over. Talented top actor Rishi Kapoor, Rajat, and Ratna Patak played the other prominent roles in the film which has been directed by Shakun Batra. Karan Johar produced the film on Dharma Productions banner. With some promising young actors teaming up and the movie coming from a leading production house, K&S released between huge expectations all over on March 18th. KaS, as expected, received an exceptional response from the audience all over. The movie has been declared as a blockbuster and the collections never seemed to slow down. The film made huge money in its first week, and the collections stayed healthy even in its second week. The emotional episodes and the heart touching climax along with the performances by the leading actors are said to be the major highlight of the movie. K&S collected Rs 70.23 crores in 19 days of its box-office run. Kapoor & Sons stayed active despite many new movies released in the recent weeks. The film is said to be one of the biggest blockbusters in Bollywood that released this year. after its alia’s movie ?